This entry was posted in Research, Writing and tagged research, Writing on February 6, 2019 by Dr. Darrin. used to answer these questions. In other words, students will take statistics and pass the class. Then they will take research methods, collect data, and have no idea how to analyze the data even though they have the necessary skills in statistics to succeed. This means that the students have a theoretical understanding of statistics but struggle in the application of it. In this post, we will look at some of the connections between research questions and statistics. Variables are important because how they are measured affects the type of question you can ask and get answers to. Students often have no clue how they will measure a variable and therefore have no idea how they will answer any research questions they may have. Another aspect that can make this confusing is that many variables can be measured more than one way. Sometimes the variable “salary” can be measured in a continuous manner or in a categorical manner. The superiority of one or the other depends on the goals of the research. It is critical to support students to have a thorough understanding of variables in order to support their research. In general, there are two types of research questions. These two types are descriptive and relational questions. Descriptive questions involve the use of descriptive statistic such as the mean, median, mode, skew, kurtosis, etc. The purpose is to describe the sample quantitatively with numbers (ie the average height is 172cm) rather than relying on qualitative descriptions of it (ie the people are tall). Below are several example research questions that are descriptive in nature. What is the average height of the participants in the study? What proportion of the sample is passed the exam? What are the respondents perceptions towards the cafeteria? These questions are not intellectually sophisticated but they are all answerable with descriptive statistical tools. Question 1 can be answered by calculating the mean. Question 2 can be answered by determining how many passed the exam and dividing by the total sample size. Question 3 can be answered by calculating the mean of all the survey items that are used to measure respondents perception of the cafeteria. Understanding the link between research question and statistical tool is critical. However, many people seem to miss the connection between the type of question and the tools to use. Relational questions look for the connection or link between variables. Within this type there are two sub-types. Comparison question involve comparing groups. The other sub-type is called relational or an association question. Is there a difference in height by gender among the participants? Is there a difference in reading scores by grade level? Is there a difference in job satisfaction in based on major? Each of these questions can be answered using ANOVA or if we want to get technical and there are only two groups (ie gender) we can use t-test. This is a broad overview and does not include the complexities of one-sample test and or paired t-test. Relational or association question involve continuous variables primarily. The goal is to see how variables move together. For example, you may look for the relationship between height and weight of students. Common questions include the following. Is there a relationship between height and weight? Does height and show size explain weight? Questions 1 can be answered by calculating the correlation. Question 2 requires the use of linear regression in order to answer the question. The challenging as a teacher is showing the students the connection between statistics and research questions from the real world. It takes time for students to see how the question inspire the type of statistical tool to use. Understanding this is critical because it helps to frame the possibilities of what to do in research based on the statistical knowledge one has. This entry was posted in quantitative research, Research and tagged quantitative research, research, research problem on December 28, 2018 by Dr. Darrin. Some of the biggest challenges in helping students with research is their lack of preparation. The problem is not an ignorance of statistics or research design as that takes only a little bit of support. The real problem is that students want to do research without hardly reading any research and lacking knowledge of how research writing is communicated. This post will share some prerequisites to performing research. 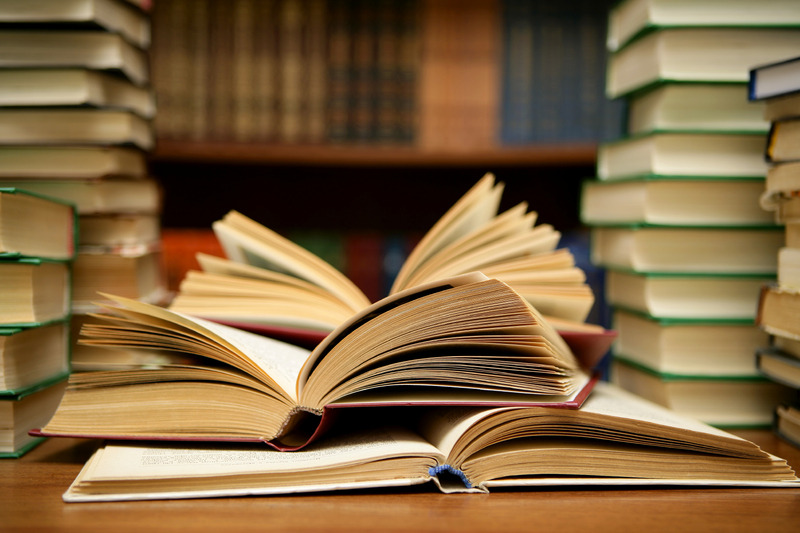 Extensive reading means reading broadly about a topic and not focusing too much on specifics. Therefore, you read indiscriminately perhaps limited yourself only to your general discipline. In order to communicate research, you must first be familiar with the vocabulary and norms of research. This can be learned to a great extent through reading academic empirical articles. The ananoloy I like to use is how a baby learns. By spends large amounts of time being exposed to the words and actions of others. The baby has no real idea in terms of what is going on at first. However, after continuous exposure, the child begins to understand the words and actions fo those around them and even begins to mimic the behaviors. In many ways, this is the purpose of reading a great deal before even attempting to do any research. Just as the baby, a writer needs to observe how others do things, continue this process even if they do not understand, and attempt to imitate the desired behaviors. You must understand the forms of communication as well as the cultural expectations of research writing and this can only happen through direct observation. At the end of this experience, you begin to notice a pattern in terms of the structure of research writing. The style is highly ridge with litter variation. It is hard to say how much extensive reading a person needs. Generally, the more reading that was done in the past the less reading needed to understand the structure of research writing. If you hate to read and did little reading in the past you will need to read a lot more to understand research writing then someone with an extensive background in reading. In addition, if you are trying to write in a second language you will need to read much more than someone writing in their native language. Extensive reading is just reading. There is no notetaking or even highlighting. You are focusing on exposure only. Just as the observant baby so you are living in the moment trying to determine what is the appropriate behavior. If you don’t understand you need to keep going anyway as the purpose is quantity and not quality. Generally, when the structure of the writing begins to become redundant ad you can tell what the author is doing without having to read too closely you are ready to move on. Intensive reading is reading more for understanding. This involves slows with the goal of deeper understanding. Now you select something, in particular, you want to know. Perhaps you want to become more familiar with the writing of one excellent author or maybe there is one topic in particular that you are interested in. With intensive writing, you want to know everything that is happening in the text. To achieve this you read fewer articles and focus much more on quality over quantity. By the end of the extensive and intensive reading, you should be familiar with the following. The basic structure of research writing even if you don’t understand why it is the way it is. A more thorough understanding of something specific you read about during your intensive reading. Some sense of purpose in terms of what you need to do for your own writing. A richer vocabulary and content knowledge related to your field. Once a student has read a lot of research there is some hope that they can now attempt to write in this style. As the teacher, it is my responsibility to point out the structure of research writing which involves such as ideas as the 5 sections and the parts of each section. Students grasp this but they often cannot build paragraphs. In order to write academic research, you must know the purpose of main ideas, supporting details, and writing patterns. If these terms are unknown to you it will be difficult to write research that is communicated clearly. The main idea is almost always the first sentence of a paragraph and writing patterns provide different ways to organize the supporting details. This involves understanding the purpose of each paragraph that is written which is a task that many students could not explain. This is looking at writing from a communicative or discourse perspective and not at a minute detail or grammar one. The only way to do this is to practice writing. I often will have students develop several different reviews of literature. During this experience, they learn how to share the ideas of others. The next step is developing a proposal in which the student shares their ideas and someone else’s. The final step is writing a formal research paper. To write you must first observe how others write. Then you need to imitate what you saw. Once you can do it what others have done it will allow you to ask questions about why things are this way. Too often, people just want to write without even understanding what they are trying to do. This leads to paralysis at best (I don’t know what to do) to a disaster at worst (spending hours confidently writing garbage). The enemy to research is not methodology as many people write a lot without knowledge of stats or research design because they collaborate. The real enemy of research is neglecting the preparation of reading and the practicing of writing. This entry was posted in Research, Writing and tagged research, Writing on May 9, 2018 by Dr. Darrin. Writing the results of a research paper is difficult. As a researcher, you have to try and figure out if you answered the question. In addition, you have to figure out what information is important enough to share. As such it is easy to get stuck at this stage of the research experience. Below are some ideas to help with speeding up this process. This may seem obvious but probably the best advice I could give a student when writing their results section is to be sure to answer their questions in the order they presented them in the introduction of their study. This helps with cohesion and coherency. The reader is anticipating answers to these questions and they often subconsciously remember the order the questions came in. If a student answers the questions out of order it can be jarring for the reader. When this happens the reader starts to double check what the questions were and they begin to second-guess their understanding of the paper which reflects poorly on the writer. An analogy would be that if you introduce three of your friends to your parents you might share each person’s name and then you might go back and share a little bit of personal information about each friend. When we do this we often go in order 1st 2nd 3rd friend and then going back and talking about the 1st friend. The same courtesy should apply when answering research questions in the results section. Whoever was first is shared first etc. If you have a small amount of information to share writing in paragraphs is practical. Defining small depends on how much space you have to write as well but generally anything more than five ideas should be placed in a table and referred too. Tables are for sharing large amounts of information. If an answer to a research question requires more than five different pieces of information a table may be best. You can extract really useful information from a table and place it directly in paragraphs while referring the reader to the table for even more information. Visuals such as graphs and plots are not used as frequently in research papers as I would have thought. This may be because they take up so much space in articles that usually have page limits. In addition, readers of an academic journal are pretty good at visually results mentally based on numbers that can be placed in a table. Therefore, visuals are most appropriate for presentations and writing situations in which there are fewer constraints on the length of the document such as a thesis or dissertation. Sometimes I have had students try to explain the results while presenting them. I cannot say this is wrong, however, it can be confusing. The reason it is so confusing is that the student is trying to do two things at the same time which are present the results and interpret them. This would be ok in a presentation and even expected but when someone is reading a paper it is difficult to keep two separate threads of thought going at the same time. Therefore, the meaning or interpretation of the results should be saved for the Discussion Conclusion section. This entry was posted in quantitative research, Research, Writing and tagged research, Writing on March 28, 2018 by Dr. Darrin. Students often struggle with shaping their methodology section in their paper. The problem is often that students do not see the connection between the different sections of a research paper. This inability to connect the dots leads to isolated thinking on the topic and inability to move forward. The methodology section of a research paper plays a critical role. In brief, the purpose of a methodology is to explain to your readers how you will answer your research questions. In the strictest sense, this is important for reproducing a study. Therefore, what is really important when writing a methodology is the research questions of the study. The research questions determine the following of a methodology. What this means is that a student must know what they want to know in order to explain how they will find the answers. Below is a description of these sections along with one section that is not often influenced by the research questions. In the sample section of the methodology, it is common or the student to explain the setting of the study, provide some demographics, and explain the sampling method. In this section of the methodology, the goal is to describe what the reader needs to know about the participants in order to understand the context from which the results were derived. The research design explains specifically how the data was collected. There are several standard ways to do this in the social sciences such. Within this section, some academic disciplines also explain the scales or the tool used to measure the variable(s) of the study. Again, it is impossible to develop this section of the research questions are unclear or unknown. The data analysis section provides an explanation of how the answers were calculated in a study. Success in this section requires a knowledge of the various statistical tools that are available. However, understanding the research questions is key to articulating this section clearly. A final section in many methodologies is ethics. The ethical section is a place where the student can explain how the protected participant’s anonymity, made sure to get the permission and other aspects of morals. This section is required by most universities in order to gain permission to do research. However, it is often missing from journals. The methodology is part of the larger picture of communicating one’s research. It is important that a research paper is not seen as isolated parts but rather as a whole. The reason for this position is that a paper cannot make sense on its own if any of these aspects are missing. This entry was posted in Research, Writing and tagged research, Writing on March 26, 2018 by Dr. Darrin. Academic and applied research are perhaps the only two ways that research can be performed. In this post, we will look at the differences between these two perspectives on research. Research ON your field is research is research that is searching for best practice. It looks at how your academic area is practiced in the real world. A scholar will examine how well a theory is being applied or used in a real-world setting and make recommendations. For example, in education, if a scholar does research in reading comprehension, they may want to determine what are some of the most appropriate strategies for teaching reading comprehension. The scholar will look at existing theories and such which one(s) are most appropriate for supporting students. Research ON your field is focused on existing theories that are tested with the goal of developing recommendations for improving practice. Research FOR your field is slightly different. This perspective seeks to expand theoretical knowledge about your field. In orders, the scholar develops new theories rather than assess the application of older ones. An example of this in education would be developing a new theory in reading comprehension. By theory, it is meant explanation. Famous theories in education include Piaget’s stages of development, Kohlberg’s stages of moral development, and more. At their time each of these theories pushes the boundaries of our understanding of something. The main thing about academic research is that it leads to recommendations but not necessarily to answers that solve problems. Answering problems is something that is done with applied research. Applied research is also known as research IN your field. This type of research is often performed by practitioners in the field. Formative research is for identifying problems. For example, a teacher may notice that students are not performing well or doing their homework. Formative applied research is when the detective hat is put on and the teacher begins to search for the cause of this behavior. The results of formative research lead to some sort of an action plan to solve the problem. During the implementation of the solution, monitoring applied research is conducted. Monitoring research is conducted during implementation of a solution to see how things are going. For example, if the teacher discovers that students are struggling with reading because they are struggling with phonological awareness. They may implement a review program of this skill for the students. Monitoring would involve assessing student performance of reading during the program. Summative applied research is conduct at the end of implementation to see if the objectives of the program were met. Returning to the reading example, if the teacher’s objective was to improve reading comprehension scores 10% the summative research would assess how well the students can now read and whether there was a 10% improvement. In education, applied research is also known as action research. Research can serve many different purposes. Academics focus on recommendations, not action while practitioners want to solve problems and perhaps not recommend as much. The point is that understanding what type of research you are trying to conduct can help you in shaping the direction of your study. This entry was posted in Research and tagged action research, research, research process on August 30, 2017 by Dr. Darrin. Performing a data analysis in the realm of data science is a difficult task due to the huge number of decisions that need to be made. For some people, plotting the course to conduct an analysis is easy. However, for most of us, beginning a project leads to a sense of paralysis as we struggle to determine what to do. You really cannot analyze data until you first determine what it is you want to know. It is tempting to just jump in and start looking for interesting stuff but you will not know if something you find is interesting unless it helps to answer your question(s). There are several types of research questions. The point is you need to ask them in order to answer them. Data exploration allows you to determine if you can answer your questions with the data you have. In data science, the data is normally already collected by the time you are called upon to analyze it. As such, what you want to find may not be possible. In addition, exploration of the data allows you to determine if there are any problems with the data set such as missing data, strange variables, and if necessary to develop a data dictionary so you know the characteristics of the variables. Your research questions and the data exploration process helps you to determine what kind of model to develop. The factors that can affect this is whether your data is supervised or unsupervised and whether you want to classify or predict numerical values. Once a model is developed it is time to explain what it means. Sometimes you can make a really cool model that nobody (including yourself) can explain. This is especially true of “black box” methods such as support vector machines and artificial neural networks. Models need to normally be explainable to non-technical stakeholders. With interpretation, you are trying to determine “what does this answer mean to the stakeholders?” For example, if you find that people who smoke are 5 times more likely to die before the age of 50 what are the implications of this? How can the stakeholders use this information to achieve their own goals? In other words, why should they care about what you found out? You must remember the stakeholders because this affects how you communicate. How you speak to business professionals would be different from academics. Next, you must share the answers to the questions. This can be done with charts, figures, illustrations etc. Data visualization is an expertise of its own. Lastly, you explain how this information is useful in a practical way. The process shared here is one way to approach the analysis of data. Think of this as a framework from which to develop your own method of analysis. This entry was posted in Data mining, machine learning and tagged data analysis, data science, research on March 24, 2017 by Dr. Darrin. Embedded design is the simultaneous collection of quantitative and qualitative data with one form of data by supportive to the other. The supportive data augments the conclusions of the main data collection. The benefits of this design is that allows for one method to lead the analysis with the secondary method provides additional information. For example, quantitative measures are excellent at recording the results of an experiment. Qualitative measures would be useful in determining how participants perceived their experience in the experiment. A downside to this approach making sure the secondary method is truly supporting the overall research. Quantitative and qualitative methods natural answer different research questions. Therefore, the research questions of a study must be worded in a way that allows for cooperation between qualitative and quantitative methods. The transformative design is more of a philosophy than a mixed method design. This design can employ any other mixed method design. The main difference that transformative designs focus on helping a marginalized population with the goal of bringing about change. For example, a researcher might do a study Asian students facing discrimination in a predominately African American high school. The goal of the study would be to document the experiences of Asian students in order to provide administrators with information on the extent of this problem. Such a focus on the oppressed is drawn heavily from Critical Theory which exposes how oppression takes place through education. The emphasis on change is derived from Dewy and progressivism. Multiphase design is actually the use of several designs over several studies. This is a massive and supremely complex process. You would need to tie together several different mixed method studies under one general research problem. From this, you can see that this is not a commonly used design. For example, you may decide to continue doing research into Asian student discrimination at African American high schools. The first study might employ an explanatory design. The second study might employ and exploratory design. The last study might be a transformative design. After completing all this work, you would need to be able to articulate the experiences with discrimination of the Asian students. This is not an easy task by any means. As such, if and when this design is used, it often requires the teamwork of several researchers. Mixed method designs require a different way of thinking when it comes to research. The uniqueness of this approach is the combination of qualitative and quantitative methods. This mixing of methods has advantages and disadvantage. The primary point to remember is that the most appropriate design depends on the circumstances of the study. This entry was posted in Research and tagged research on May 20, 2016 by Dr. Darrin. Mix Methods research involves the combination of qualitative and quantitative approaches to addressing a research problem. Generally, qualitative and quantitative methods have separate philosophical positions when it comes to how to uncover insights in addressing research questions. For many, mixed methods have their own philosophical position, which is pragmatism. Pragmatists believe that if it works it’s good. Therefore, if mixed methods lead to a solution it’s an appropriate method to use. This design involves the simultaneous collecting of qualitative and quantitative data. The results are then compared to provide insights into the problem. The advantage of this design is the quantitative data provides for generalizability while the qualitative data provides information about the context of the study. However, the challenge is in trying to merge the two types of data. Qualitative and quantitative methods answer slightly different questions about a problem. As such it can be difficult to paint a picture of the results that are comprehensible. This design puts emphasis on the quantitative data with qualitative data playing a secondary role. Normally, the results found in the quantitative data are followed up on in the qualitative part. For example, if you collect surveys about what students think about college and the results indicate negative opinions, you might conduct an interview with students to understand why they are negative towards college. A Likert survey will not explain why students are negative. Interviews will help to capture why students have a particular position. The advantage of this approach is the clear organization of the data. Quantitative data is more important. The drawback is deciding what about the quantitative data to explore when conducting the qualitative data collection. This design is the opposite of explanatory. Now the qualitative data is more important than the quantitative. This design is used when you want to understand a phenomenon in order to measure it. It is common when developing an instrument to interview people in focus groups to understand the phenomenon. For example, if I want to understand what cellphone addiction is I might ask students to share what they think about this in interviews. From there, I could develop a survey instrument to measure cell phone addiction. The drawback to this approach is the time consumption. It takes a lot of work to conduct interviews, develop an instrument, and assess the instrument. Mixed methods are not that new. However, they are still a somewhat unusual approach to research in many fields. Despite this, the approaches of mixed methods can be beneficial depending on the context. This entry was posted in qualitative research, quantitative research, Research and tagged research on May 11, 2016 by Dr. Darrin. Machine learning is a tool used in analytics for using data to make a decision for action. This field of study is at the crossroads of regular academic research and action research used in professional settings. This juxtaposition of skills has led to exciting new opportunities in the domains of academics and industry. This post will provide information on basic types of machine learning which includes predictive models, supervised learning, descriptive models, and unsupervised learning. Predictive models do as their name implies. Predictive models predict one value based on other values. For example, a model might predict who is most likely to buy a plane ticket or purchase a specific book. Predictive models are not limited to the future. They can also be used to predict something that has already happened but we are not sure when. For example, data can be collected from expectant mothers to determine the date that they conceived. Such information would be useful in preparing for birth. Predictive models are intimately connected with supervised learning. Supervised learning is a form of machine learning in which the predictive model is given clear direction as to what they need to learn and how to do it. For example, if we want to predict who will be accepted or rejected for a home loan we would provide clear instructions to our model. We might include such features as salary, gender, credit score, etc. These features would be used to predict whether an individual person should be accepted or rejected for the home loan. The supervisors in this example or the features (salary, gender, credit score) used to predict the target feature (home loan). The target feature can either be a classification or a numeric prediction. A classification target feature is a nominal variable such as gender, race, type of car, etc. A classification feature has a limited number of choices or classes that the feature can take. In addition, the classes are mutually exclusive. At least in machine learning, someone can only be classified as male or female, current algorithms cannot place a person in both classes. A numeric prediction predicts a number that has an infinite number of possibilities. Examples include height, weight, and salary. Descriptive models summarize data to provide interesting insights. There is no target feature that you are trying to predict. Since there is no specific goal or target to predict there are no supervisors or specific features that are used to predict the target feature. Instead, descriptive models use a process of unsupervised learning. There are no instructions given to model as to what to do per say. Descriptive models are very useful for discovering patterns. For example, one descriptive model analysis found a relationship between beer purchases and diaper purchases. It was later found that when men went to the store they often would be beer for themselves and diapers for their small children. Stores used this information and they placed beer and diapers next to each in the stores. This led to an increase in profits as men could now find beer and diapers together. This kind of relationship can only be found through machine learning techniques. The model you used depends on what you want to know. Prediction is for, as you can guess, predicting. With this model, you are not as concern about relationships as you are about understanding what affects specifically the target feature. If you want to explore relationships then descriptive models can be of use. Machine learning models are tools that are appropriate for different situations. This entry was posted in Data mining, machine learning, Statistics and tagged machine learning, research on April 22, 2016 by Dr. Darrin. Processes serve the purpose of providing people with clear step-by-step procedures to accomplish a task. In many ways, a process serves as a shortcut to solving a problem. As data mining is a complex situation with an endless number of problems there have been developed several processes for completing a data mining project. In this post, we will look at the Cross-Industry Standard Process for Data Mining (CRISP-DM). Once a purpose and questions have been developed for data mining, it is necessary to determine what it will take to answer the questions. Specifically, the data scientist assesses the data requirements, description, collection, and assesses data quality. In many ways, data understanding is similar to the methodology of a standard research paper in which you assess how you will answer the research questions. It is particularly common to go back and forth between steps one and two. Organizational understanding influences data understanding which influences data understanding. Data preparation involves cleaning the data. Another term for this is data mugging. This is the main part of an analysis in data mining. Often the data comes in a very messy way with information spread all over the place and incoherently. This requires the researcher to carefully deal with this problem. A model provides a numerical explanation of something in the data. How this is done depends on the type of analysis that is used. As you develop various models you are arriving at various answers to your research questions. It is common to move back and forth between step 3 and 4 as the preparation affects the modeling and the type of modeling you may want to develop may influence data preparation. The results of this step can also be seen as being similar to the results section of an empirical paper. Evaluation is about comparing the results of the study with the original questions. In many ways, it is about determining the appropriateness of the answers to the research questions. This experience leads to ideas for additional research. As such, this step is similar to the discussion section of a research paper. The last step is when the results are actually used for decision-making or action. If the results indicate that a company should target people under 25 then this is what they do as an example. The CRISP-DM process is a useful way to begin the data mining experience. The primary goal of data mining is providing evidence for making decisions and or taking action. This end goal has shaped the development of a clear process for taking action. This entry was posted in Data mining, Research and tagged Data mining, quantitative research, research on March 2, 2016 by Dr. Darrin. Dealing with large amounts of data has been a problem throughout most of human history. Ancient civilizations had to keep large amounts of clay tablets, papyrus, steles, parchments, scrolls etc. to keep track of all the details of an empire. However, whenever it seemed as though there would be no way to hold any more information a new technology would be developed to alleviate the problem. When people could not handle keeping records on stone paper scrolls were invented. When scrolls were no longer practical books were developed. When hand-copying books were too much the printing press came along. By the mid 20th century there were concerns that we would not be able to have libraries large enough to keep all of the books that were being developed. With this problem came the solution of the computer. One computer could hold the information of several dozen if not hundreds of libraries. Now even a single computer can no longer cope with all of the information that is constantly being developed for just a single subject. This has lead to computers working together in networks to share the task of storing information. With data spread across several computers, it makes analyzing data much more challenging. It was now necessary to mine for useful information in a way that people used to mine for gold in the 19th century. Big data is data that is too large to fit within the memory of a single computer. Analyzing data that is spread across a network of databases takes skills different from traditional statistical analysis. This post will explain some of the characteristics of big data as well as data mining. Data mining is the process of discovering a model in a big dataset. Through the development of an algorithm, we can find specific information that helps us to answer our questions. Generally, there are two ways to mine data and these are extraction and summarization. Extraction is the process of pulling specific information from a big dataset. For example, if we want all the addresses of people who bought a specific book from Amazon the result would be an extraction from a big data set. Summarization is reducing a dataset to describe it. We might do a cluster analysis in which similar data is combined on a characteristic. For example, if we analyze all the books people ordered through Amazon last year we might notice that one cluster of groups buys mostly religious books while another buys investment books. Big data will only continue to get bigger. Currently, the response has been to just use more computers and servers. As such, there is now a need for finding information on many computers and servers. This is the purpose of data mining, which is to find pertinent information that answers stakeholders questions. This entry was posted in machine learning, quantitative research, Research and tagged machine learning, quantitative research, research on February 26, 2016 by Dr. Darrin. Decision trees are useful for splitting data based into smaller distinct groups based on criteria you establish. This post will attempt to explain how to develop decision trees in R.
We will now make a plot of the data based on education as the groups and age and wage as the x and y variable. Below is the code followed by the plot. Please note that education is divided into 5 groups as indicated in the chart. We are now going to develop the model for the decision tree. We will use age and wage to predict education as shown in the code below. We now need to create a visual of the model. This involves installing the package called ‘rattle’. You can install ‘rattle’ separately yourself. After doing this below is the code for the tree model followed by the diagram. At the top is node 1 which is called ‘HS Grad” the decimals underneath is the percentage of the data that falls within the “HS Grad” category. As the highest node, everything is classified as “HS grad” until we begin to apply our criteria. Underneath nod 1 is a decision about wage. If a person makes less than 112 you go to the left if they make more you go to the right. Nod 2 indicates the percentage of the sample that was classified as HS grade regardless of education. 14% of those with less than a HS diploma were classified as a HS Grade based on wage. 43% of those with a HS diploma were classified as a HS grade based on income. The percentage underneath the decimals indicates the total amount of the sample placed in the HS grad category. Which was 57%. This process is repeated for each node until the data is divided as much as possible. You can predict individual values in the dataset by using the ‘predict’ function with the test data as shown in the code below. Prediction Trees are a unique feature in data analysis for determining how well data can be divided into subsets. It also provides a visual of how to move through data sequentially based on characteristics in the data. This entry was posted in Data Visualization, machine learning, quantitative research, R programming and tagged machine learning, quantitative research, R programming, research on February 1, 2016 by Dr. Darrin. It is common in machine learning to look at the training set of your data visually. This helps you to decide what to do as you begin to build your model. In this post, we will make several different visual representations of data using datasets available in several R packages. We are going to explore data in the “College” dataset in the “ISLR” package. If you have not done so already, you need to download the “ISLR” package along with “ggplot2” and the “caret” package. Once these packages are installed in R you want to look at a summary of the variables use the summary function as shown below. You should get a printout of information about 18 different variables. Based on this printout, we want to explore the relationship between graduation rate “Grad.Rate” and student to faculty ratio “S.F.Ratio”. This is the objective of this post. Next, we need to create a training and testing dataset below is the code to do this. The explanation behind this code was covered in predicting with caret so we will not explain it again. You just need to know that the dataset you will use for the rest of this post is called “trainingSet”. We now want to explore the relationship between graduation rates and student to faculty ratio. We will be used the ‘ggpolt2’ package to do this. Below is the code for this followed by the plot. As you can see, there appears to be a negative relationship between student faculty ratio and grad rate. In other words, as the ration of student to faculty increases there is a decrease in the graduation rate. Next, we will color the plots on the graph based on whether they are a public or private university to get a better understanding of the data. Below is the code for this followed by the plot. We will now plot the same data but will add a regression line. This will provide us with a visual of the slope. Below is the code followed by the plot. Most of this code should be familiar to you. We saved the plot as the variable ‘collegeplot’. 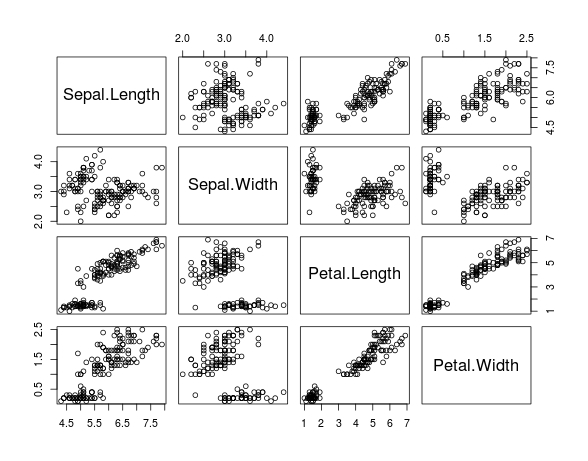 In the second line of code, we add specific coding for ‘ggplot2’ to add the regression line. ‘lm’ means linear model and formula is for creating the regression. Our data is now divided into three equal sizes. As you can see, the negative relationship continues even when student-faculty is divided into three equally size groups. However, our information about private and public college is missing. To fix this we need to make a table as shown in the code below. In this post, we found that there is a negative relationship between student-faculty ratio and graduation rate. We also found that private colleges have a lower student-faculty ratio and a higher graduation rate than public colleges. In other words, the status of a university as public or private moderates the relationship between student-faculty ratio and graduation rate. You can probably tell by now that R can be a lot of fun with some basic knowledge of coding. This entry was posted in Correlation/Regression, Data Visualization, machine learning, quantitative research, R programming, Research, Statistics and tagged data analysis, data visualization, R programming, research, Simple linear regression on January 11, 2016 by Dr. Darrin. In this post, we will look at how to perform a simple regression using R. We will use a built-in dataset in R called ‘mtcars.’ There are several variables in this dataset but we will only use ‘wt’ which stands for the weight of the cars and ‘mpg’ which stands for miles per gallon. We want to know the association or relationship between the weight of a car and miles per gallon. We want to see how much of the variance of ‘mpg’ is explained by ‘wt’. Below is the code for this. Inside this variable, we used the ‘lm’ function to tell R to make a linear model. Inside the function, we put ‘mpg ~ wt’ the ‘~’ sign means ’tilda’ in English and is used to indicate that ‘mpg’ is a function of ‘wt’. This section is the actual notation for the regression model. After the comma, we see ‘data = mtcars’ this is telling R to use the ‘mtcar’ dataset. Once you pressed enter you probably noticed nothing happens. The model ‘Carmodel’ was created but the results have not been displayed. Below is various information you can extract from your model. The ‘summary’ function is useful for pulling most of the critical information. Below is the code for the output. We made the variable ‘coef_Carmodel’ and stored the coefficients (intercept and slope) of the ‘Carmodel’ using the ‘coef’ function. We will need this information soon. Next, we plot the ‘mtcars’ dataset using ‘mpg’ and ‘wt’. To add the regression line we use the ‘abline’ function. To add the intercept and slope we use a = the intercept from our ‘coef_Carmodel’ variable which is subset  from this variable. For slope, we follow the same process but use a . This will add the line and your graph should look like the following. From the visual, you can see that as weight increases there is a decrease in miles per gallon. R is capable of much more complex models than the simple regression used here. However, understanding the coding for simple modeling can help in preparing you for much more complex forms of statistical modeling. This entry was posted in quantitative research, R programming, Research and tagged quantitative research, R programming, research on November 30, 2015 by Dr. Darrin. Within groups, experimental design is the use of only one group in an experiment. This is in contrast to a between-group design which involves two or more groups. Within-group design is useful when the number of is two low in order to split them into different groups. There are two common forms of within-group experimental design, time-series, and repeated measures. Under time series there are interrupted times series and equivalent time series. Under repeated-measure, there is only repeated measure design. In this post, we will look at the following forms of within-group experimental design. Interrupted time series design involves several pre-tests followed by an intervention and then several post-test of one group. By measuring the several times, many threats to internal validity are reduced, such as regression, maturation, and selection. The pre-test results are also used as covariates when analyzing the post-tests. Equivalent time series design involves the use of a measurement followed by intervention followed by measurement etc. In many ways, this design is a repeated post-test only design. The primary goal is to plot the results of the post-test and determine if there is a pattern that develops over time. For example, if you are tracking the influence of blog writing on vocabulary acquisition, the intervention is blog writing and the dependent variable is vocabulary acquisition. As the students write a blog, you measure them several times over a certain period. If a plot indicates an upward trend you could infer that blog writing made a difference in vocabulary acquisition. Repeated measures is the use of several different treatments over time. Before each treatment, the group is measured. Each post-test is compared to other post-test to determine which treatment was the best. Within-group experimental designs are used when it is not possible to have several groups in an experiment. The benefits include needing fewer participants. However, one problem with this approach is the need to measure several times which can be labor intensive. This entry was posted in quantitative research, Research and tagged quantitative research, research on November 25, 2015 by Dr. Darrin. Analysis of variance (ANOVA) is used when you want to see if there is a difference in the means of three or more groups due to some form of treatment(s). In this post, we will look at conducting an ANOVA calculation using R.
We are going to use a dataset that is already built into R called ‘InsectSprays.’ This dataset contains information on different insecticides and their ability to kill insects. What we want to know is which insecticide was the best at killing insects. In the dataset ‘InsectSprays’, there are two variables, ‘count’, which is the number of dead bugs, and ‘spray’ which is the spray that was used to kill the bug. For the ‘spray’ variable there are six types label A-F. There are 72 total observations for the six types of spray which comes to about 12 observations per spray. In this variable, we used the function ‘aov’ which is the ANOVA function. Within the ‘aov’ function we told are to determine the count by the difference sprays that is what the ‘~’ tilde operator does. Next, we pressed ‘enter’ and nothing happens. This is because we have to make R print the results by typing the name of the variable “BugModel” and pressing ‘enter’. The results do not tell us anything too useful yet. However, now that we have the ‘BugModel’ saved we can use this information to find the what we want. These results indicate that there are significant results in the model as shown by the p-value being essentially zero (Pr(>F)). In other words, there is at least one mean that is different from the other means statistically. The ‘model.tables’ function tells us the means overall and for each spray. As you can see, it appears spray F is the most efficient at killing bugs with a mean of 16.667. There is a lot of information here. To make things easy, wherever there is a p adj of less than 0.05 that means that there is a difference between those two means. For example, bug spray F and E have a difference of 13.16 that has a p adj of zero. So these two means are really different statistically.This chart also includes the lower and upper bounds of the confidence interval. ANOVA is used to calculate if there is a difference of means among three or more groups. This analysis can be conducted in R using various scripts and codes. This entry was posted in ANOVA, hypothesis testing, quantitative research, R programming, Research, Statistics and tagged quantitative research, R programming, research on November 23, 2015 by Dr. Darrin. Key components of qualitative research include hermeneutics and phenomenology. This post will examine these two terms and their role in qualitative research. Hermeneutics is essential a method of interpretation of a text. The word hermeneutics comes from Hermes, the Greek messenger God. As such, at least for the ancient Greeks, there was a connection with interpreting and serving as a messenger. Today, his term is most commonly associated with theology such as biblical hermeneutics. In relation to biblical hermeneutics, Augustine (354-430) develop a process of hermeneutics that was iterative. Through studying the Bible and the meaning of one’s own interpretations of the Bible, a person can understand divine truth. There was no need to look at the context, history, or anything else. Simply the Word and your interpretation of it. In the 17th century, the Dutch philosopher Spinoza expanded on Augustine’s view of hermeneutics by stating that the text, its historical context, and even the author of a text, should be studied to understand the text. In other words, text plus context leads to truth. By combing Augustine’s view of the role of the individual in hermeneutics with Spinoza’s contribution to the context we arrive at how interpretation happens in qualitative research. In qualitative research, data interpretation (aka hermeneutics) involves the individual’s interpretation combined with the context that the data comes from. Both the personal interpretation and the context of the data influence each other. The develops in hermeneutics led to the development of the philosophy called phenomenology. Phenomenology states that a phenomenon can only be understood subjectively (from a certain viewpoint) and intuitively (through thinking and finding hidden meaning). In phenomenology, interpretation happens through describing events, analyzing an event, and by connecting a current experience to another one or by finding similarities among distinct experiences. For a phenomenologist, there is a constant work of reducing several experiences into abstract constructs through an inductive approach. This is a form of theory building that is connected with several forms of qualitative research, such as grounded theory. Hermeneutics has played an important role in qualitative research by influencing the development of phenomenology. The study of a phenomenon is for the purpose of seeing how context will influence interpretation. This entry was posted in qualitative research, Research and tagged qualitative research, research on November 20, 2015 by Dr. Darrin. In experimental research, there are two common designs. They are between and within group design. The difference between these two groups of designs is that between group involves two or more groups in an experiment while within group involves only one group. A true experiment is one in which the participants are randomly assigned to different groups. In a quasi-experiment, the researcher is not able to randomly assigned participants to different groups. Random assignment is important in reducing many threats to internal validity. However, there are times when a researcher does not have control over this, such as when they conduct an experiment at a school where classes have already been established. In general, a true experiment is always considered superior methodological to a quasi-experiment. Whether the experiment is a true experiment or a quasi-experiment. There are always two groups that are compared in the study. One group is the controlled group, which does not receive the treatment. The other group is called the experimental group, which receives the treatment of the study. It is possible to have more than two groups and several treatments but the minimum for between group designs is two groups. A pre- and post test involves measuring the groups of the study before the treatment and after the treatment. The desire normally is for the groups to be the same before the treatment and for them to be different statistically after the treatment. The reason for them being different is because of the treatment, at least hopefully. For example, let’s say you have some bushes and you want to see if the fertilizer you bought makes any difference in the growth of the bushes. You divide the bushes into two groups, one that receives the fertilizer (experimental group), and one that does not (controlled group). You measure the height of the bushes before the experiment to be sure they are the same. Then, you apply the fertilizer to the experimental group and after a period of time, you measure the heights of both groups again. If the fertilized bushes grow taller than the control group you can infer that it is because of the fertilizer. Post-test only design is when the groups are measured only after the treatment. For example, let’s say you have some corn plants and you want to see if the fertilizer you bought makes any difference.in the amount of corn produced. You divide the corn plants into two groups, one that receives the fertilizer (experimental group), and one that does not (controlled group). You apply the fertilizer to the control group and after a period of time, you measure the amount of corn produced. If the fertilized corn produces more you can infer that it is because of the fertilizer. You never measure the corn beforehand because they had not produced any corn yet. Factorial design involves the use of more than one treatment. Returning to the corn example, let’s say you want to see not only how fertilizer affects corn production but also how the amount of water the corn receives affects production as well. In this example, you are trying to see if there is an interaction effect between fertilizer and water. When water and fertilizer are increased does production increase, is there no increase, or if one goes up and the other goes down does that have an effect? This entry was posted in quantitative research, Research and tagged experiments, quantitative research, research on November 18, 2015 by Dr. Darrin. There are times when conducting research that you want to know if there is a difference in categorical data. For example, is there a difference in the number of men who have blue eyes and who have brown eyes. Or is there a relationship between gender and hair color. In other words, is there a difference in the count of a particular characteristic or is there a relationship between two or more categorical variables. In statistics, the chi-square test is used to compare categorical data. In this post, we will look at how you can use the chi-square test in R.
As you can see, the data comes in the form of a list and shows hair and eye color for men and women in separate tables. The current data is unusable for us in terms of calculating differences. However, by using the ‘marign.table’ function we can make the data useable as shown in the example below. Here is what we did. We created the variable ‘HairEyeNew’ and we stored the information from ‘HairEyeColor’ into one table using the ‘margin.table’ function. The margin was set 1,2 for the table. Now all are data from the list are combined into one table. We now want to see if there is a particular relationship between hair and eye color that is more common. To do this, we calculate the chi-square statistic as in the example below. The test tells us that one or more of the relationships are more common than others within the table. To determine which relationship between hair and eye color is more common than the rest we will calculate the proportions for the table as seen below. As you can see from the table, brown hair and brown eyes are the most common (0.20 or 20%) flowed by blond hair and blue eyes (0.15 or 15%). This entry was posted in quantitative research, R programming, Research and tagged quantitative research, R programming, research on November 16, 2015 by Dr. Darrin. Epistemology is the study of the nature of knowledge. It deals with questions as is there truth and or absolute truth, is there one way or many ways to see something. In research, epistemology manifest itself in several views. The two extremes are positivism and interpretivism. Positivism asserts that all truth can be verified and proven scientifically and can be measured and or observed. This position discounts religious revelation as a source of knowledge as this cannot be verified scientifically. The position of positivist is also derived from realism in that there is an external world out there that needs to be studied. For researchers, positivism is the foundation of quantitative research. Quantitative researchers try to be objective in their research, they try to avoid coming into contact with whatever they are studying as they do not want to disturb the environment. One of the primary goals is to make generalizations that are applicable in all instances. For quantitative researchers, they normally have a desire to test a theory. In other words, the develop one example of what they believe is a truth about a phenomenon (a theory) and they test the accuracy of this theory with statistical data. The data determines the accuracy of the theory and the changes that need to be made. By the late 19th and early 20th centuries, people were looking for alternative ways to approach research. One new approach was interpretivism. Interpretivism is the complete opposite of positivism in many ways. Interpretivism asserts that there is no absolute truth but relative truth based on context. There is no single reality but multiple realities that need to be explored and understood. For interpretist, There is a fluidity in their methods of data collection and analysis. These two steps are often iterative in the same design. Furthermore, intrepretist see themselves not as outside the reality but a player within it. Thus, they often will share not only what the data says but their own view and stance about it. Qualitative researchers are interpretists. They spend time in the field getting close to their participants through interviews and observations. They then interpret the meaning of these communications to explain a local context specific reality. While quantitative researchers test theories, qualitative researchers build theories. For qualitative researchers, they gather data and interpret the data by developing a theory that explains the local reality of the context. Since the sampling is normally small in qualitative studies, the theories do not often apply to many. There is little purpose in debating which view is superior. Both positivism and interpretivism have their place in research. What matters more is to understand your position and preference and to be able to articulate in a reasonable manner. It is often not what a person does and believes that is important as why they believe or do what they do. This entry was posted in Philosophy, qualitative research, quantitative research, Research and tagged philosophy, qualitative research, quantitative research, research on November 13, 2015 by Dr. Darrin. Comparing groups is a common goal in statistics. This is done to see if there is a difference between two groups. Understanding the difference can lead to insights based on statistical results. In this post, we will examine the following statistical test for comparing samples. The T-test indicates if there is a significant statistical difference between two groups. This is useful if you know what the difference between the two groups are. For example, if you are measuring height of men and women, if you find that men are taller through a t-test, you can state that gender influences height because the only difference between men and women in this example is their gender. Below is an example of conducting a t-test in R. In the example, we are looking at if there is a difference in body temperature between beavers who are active versus beavers who are not. The output provides a lot of information. The t-stat is -18.58 any number at + 1.96 indicates statistical difference. Df stands for degrees of freeedom and is used to determine the t-stat and p-value. The p-value is basically zero. Anything less than 0.05 is considered statistically significant. Next, we have the 95% confidence interval, which is the range of the difference of the means of the two groups in the population. Lastly, we have the means of each group. Group 0, the inactive group. had a mean of 37.09684. Group 1. the active group, has a mean of 37.90306. 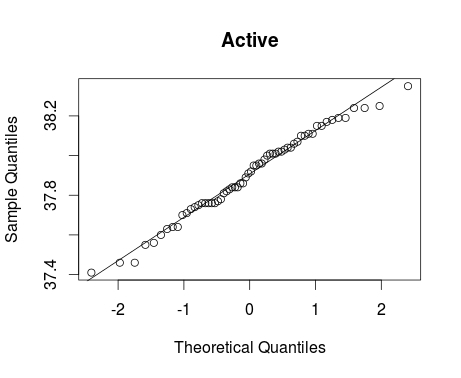 T-test assumes that the data is normally distributed. When normality is a problem, it is possible to use the Wilcoxon test instead. Below is the script for the Wilcoxon Test using the same example. A closer look at the output indicates the same results for the most part. Instead of the t-stat the W-stat is used but the p value is the same for both test. We used the ‘t.test’ function and indicate we want to see if ‘extra’ (amount of sleep) is influenced by ‘group’ (two types of sleep medication. We add the new argument of ‘paired = TRUE’ this tells R that this is a paired test. The output is the same information as in the regular t.test. The only differences is at the bottom where R only tells you the difference between the two groups and not the means of each. For this example, the people slept about 1 hour and 30 minutes longer on the second sleep medication when compared to the first. This entry was posted in quantitative research, R programming, Research and tagged quantitative research, R programming, research on November 9, 2015 by Dr. Darrin. In this post, we will try to look at ontology, which is the study of the nature of reality. In particular, we will define it as well as explain its influence on research. Ontology is the study of the nature of being. It tries to understand the reality of existence. In this body of philosophy, there are two major camps, ontological realism, and ontological idealism. Ontological realism believes that reality is objective. In other words, there is one objective reality that is external to each individual person. We are in a reality and we do not create it. Ontological idealism is the opposite extreme. This philosophy states that there are multiple realities an each depends on the person. My reality is different from your reality and each of us builds our own reality. Ontological realism is one of the philosophical foundations for quantitative research. Quantitative research is a search for an objective reality that accurately explains whatever is being studied. For qualitative researchers, ontological idealism is one of their philosophical foundations. Qualitative researchers often support the idea of multiple realities. For them, since there is no objective reality it is necessary to come contact with people to explain their reality. Something that has been alluded to but not stated specifically is the role of independence and dependence of individuals. Regardless of whether someone ascribes to ontological realism or idealis, there is the factor of whether people or independent of reality or dependent to reality. The level of independence and dependence contributes to other philosophies such as objectivism constructivism and pragmatism. Objectivism is the belief that there is a single reality that is independent of the individuals within it. Again this is the common assumption of quantitative research. At the opposite end we have constructivism which states that there are multiple realities and the are dependent on the individuals who make each respective reality. Pragmatism supports the idea of a single reality with the caveat that it is true if it is useful and works. The application of the idea depends upon the individuals, which pushes pragmatism into the realm of dependence. Quantitative and qualitative researchers differ in how they see reality. Quantitative researchers are searching for and attempting to explain a single reality while qualitative researchers are searching for and trying to explain multiple realities. These factors of reality and its dependence shape the methodologies employed by quantitative and qualitative researchers. This entry was posted in Philosophy, Research and tagged philosophy, research on November 6, 2015 by Dr. Darrin. Lastly, we will examine group comparison. One of the most common independent variables in experimental design are treatment and measured variables. Treatment variables are manipulated by the researcher. For example, if you are looking at how sleep affects academic performance, you may manipulate the amount of sleep participants receive in order to determine the relationship between academic performance and sleep. Measured variables are variables that are measured by are not manipulated by the researcher. Examples include age, gender, height, weight, etc. An experimental treatment is the intervention of the researcher to alter the conditions of an experiment. This is done by keeping all other factors constant and only manipulating the experimental treatment, it allows for the potential establishment of a cause-effect relationship. In other words, the experimental treatment is a term for the use of a treatment variable. Treatment variables usually have different conditions or levels in them. For example, if I am looking at sleep’s affect on academic performance. I may manipulate the treatment variable by creating several categories of the amount of sleep. Such as high, medium, and low amounts of sleep. Intervention is a term that means the actual application of the treatment variables. In other words, I broke my sample into several groups and caused one group to get plenty of sleep the second group to lack a little bit of sleep and the last group got nothing. Experimental treatment and intervention mean the same thing. The outcome measure is the experience of measuring the outcome variable. In our example, the outcome variable is academic performance. Experimental design often focuses on comparing groups. Groups can be compared between groups and within groups. Returning to the example of sleep and academic performance, a between group comparison would be to compare the different groups based on the amount of sleep they received. A within group comparison would be to compare the participants who received the same amount of sleep. Often there are at least three groups in an experimental study, which are the controlled, comparison, and experimental group. The controlled group receives no intervention or treatment variable. This group often serves as a baseline for comparing the other groups. The comparison group is exposed to everything but the actual treatment of the study. They are highly similar to the experimental group with the experience of the treatment. Lastly, the experimental group experiences the treatment of the study. Experiments involve treatment conditions and groups. As such, researchers need to understand their options for treatment conditions as well as what types of groups they should include in a study. This entry was posted in quantitative research, Research and tagged quantitative research, research on November 4, 2015 by Dr. Darrin. Normal distribution is an important term in statistics. When we say normal distribution, we are speaking of the traditional bell curve concept. Normal distribution is important because it is often an assumption of inferential statistics that the distribution of data points is normal. Therefore, one of the first things you do when analyzing data is to check for normality. In this post, we will look at the following ways to assess normality. The easiest and crudest way to check for normality is visually through the use of histograms. You simply look at the histogram and determine how closely it resembles a bell. As you look at the histograms, you can say that they are somewhat normal. The peaks of the data are a little high in both. Group 1 is more normal than Group 0. The problem with visual inspection is lack of accuracy in interpretation. This is partially solved by using QQ plots. 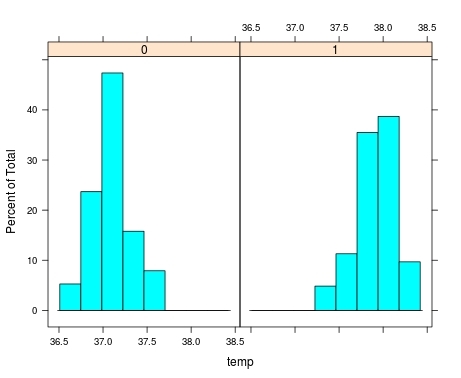 QQplots are useful for comparing your data with a normally distributed theoretical dataset. The QQplot includes a line of a normal distribution and the data points for your data for comparison. The more closely your data follows the line the more normal it is. Below is the code for doing this with our beaver information. Within the ‘qqnorm’ function we tell are to use ‘temp’ from the ‘beaver2’ dataset. From the ‘temp’ variable we subset the values that have a 1 in the ‘activ’ variable. Finally, we add the ‘qqline’ using most of the previous information. Going by sight again. The data still looks pretty good. However, one last test will determine conclusively if the dataset is normal or not. The Shapiro-Wilks normality test determines the probability that the data is normally distributed. The lower the probability the less likely that the data is normally distributed. Below is the code and results for the Shapiro test. This means that the probability of our data being normally distributed is 55% which means it is highly likely to be normal. It is necessary to always test the normality of data before data analysis. The tips presented here provide some framework for accomplishing this. This entry was posted in quantitative research, R programming, Research and tagged quantitative research, R programming, research on November 2, 2015 by Dr. Darrin. After developing an appropriate sampling method, a researcher needs to randomly assign individuals to the different groups of the study. One of the main reasons for doing this is to remove the bias of individual differences in all groups of the study. For example, if you are doing a study on intelligence. You want to make sure that all groups have the same characteristics of intelligence. This helps for the groups to equate or to be the same. This prevents people from saying the reason there are differences between groups is because the groups are different and not because of the treatment. A pre-test post-test allows a researcher to compare the measurement of something before the treatment and after the treatment. The assumption is that any difference in the scores of before and after is due to the treatment.Doing the tests takes into account the confounding of the different contexts of the setting and individual characteristics. This approach involves selecting people who are highly similar on the particular trait that is being measured. This removes the problem of individual differences when attempting to interpret the results. The more similar the subjects in the sample are the more controlled the traits of the people are controlled for. Covariates is a statistical approach in which controls are placed on the dependent variable through statistical analysis. The influence of other variables are removed from the explained variance of the dependent variable. Covariates help to explain more about the relationship between the independent and dependent variables. This is a difficult concept to understand. However, the point is that you use covariates to explain in greater detail the relationship between the independent and dependent variable by removing other variables that might explain the relationship. Matching is deliberate, rather than randomly, assigning subject to various groups. For example, if you are looking at intelligence. You might match high achievers in both groups of the study. By placing he achievers in both groups you cancel out there difference. Experimental design involves the cooperation in random assignment of inclusive differences in a sample. The goal of experimental design is to be sure that the sample groups are mostly the same in a study. This allows for concluding that what happened was due to the treatment. This entry was posted in quantitative research, Research and tagged quantitative research, research on October 28, 2015 by Dr. Darrin. The outcome is the growth of the plants.By giving the plants different experiences of sunlight I can determine if sunlight influences the growth of plants. Experiments have been around informally since the 10th century with work done in the field of medicine. The use of experiments as known today began in the early 20th century in the field of psychology. By the 1920’s group comparison became an establish characteristics of experiments. By the 1930’s, random assignment was introduced. By the 1960’s various experimental designs were codified and documented. By the 1980’s there was literature coming out that addressed threats to validity. Experiments are conducted to attempt to establish a cause and effect relationship between independent and dependent variables. You try to create a controlled environment in which you provide the experience or independent variable(s) and then measure how they affect the outcome or dependent variable. Since the setting of the experiment is controlled. You can say withou a doubt that only the experience influence the outcome. Off course, in reality, it is difficult to control all the factors in a study. The real goal is to try and limit the effect that these other factors have on the outcomes of a study. Despite their long history, experiments are relatively new in research. This design has grown and matured over the years to become a powerful method for determining cause and effect. Therefore, researchers should e aware of this approach for use in their studies. This entry was posted in quantitative research, Research and tagged quantitative research, research, scientific approach on October 21, 2015 by Dr. Darrin.